This convenient salon appliance holder is designed to store and organize blow dryers, heat irons, straightening irons, curling irons, hot combs and other accessories, Both space saving and portable, it can be wall mounted, unhooked and moved where needed throughout your salon as a tabletop caddy, or brought to client meetings to create a professional workspace. A 2-5/8 (Dia) storage ring allows you to quickly stow and retrieve your blow dryer, including those fitted with nozzles or other attachments. It can also fit and store almost any flat or round hair iron and includes two rectangular storage compartments measuring 3-1/4 (L) x 1-1/8 (W) x 2-7/8 (D), both with a rounded area extending the width to 1-3/8. The three storage tubes each measure 1-1/4, 1-1/8, and 7/8 (Dia) x 2-7/8 (D). 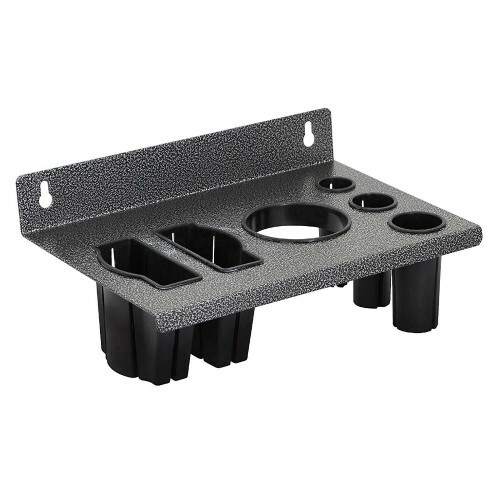 This appliance holder is extremely durable; constructed from high-grade steel in a heat resistant hammered finish, it is very attractive and will last for years and years. 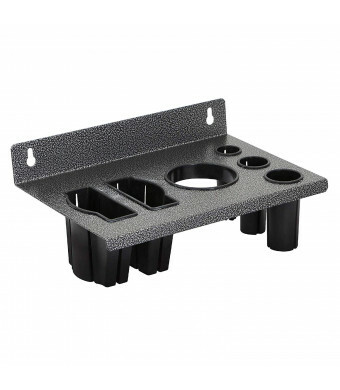 Additionally, each storage compartment is made of tough jet-black composite. Overall dimensions: 9-7/8 (W) x 6-1/2 (D) x 2-1/5 (H). The rear mounting lip measures 9-7/8 (W) x 1-1/2 (H). Two screws and anchors for wall mounting are included in the box.